The Hyundai compact car family has just become even more appealing with the launch of a fully redesigned Elantra GT. 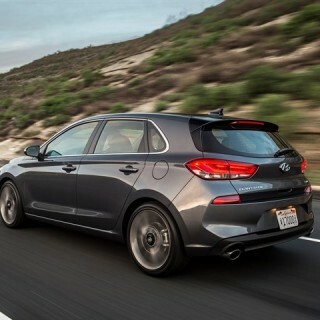 The name makes it clear that what you are getting is a sporty 5-door hatchback, but what you may not know is that it is based on the Hyundai i30 that was recently revealed in international markets. Before we dive into details, we should let you know that the all-new 2018 Hyundai Elantra GT 5-door hatchback will be available at the US dealerships this summer. A look at the exterior of the 2018 Elantra GT 5-door reveals a design that bears a strong resemblance to the European Hyundai i30. You will instantly notice the sharp crease than runs from the front fender all the way back to the taillights, which are set in a rather unique convex-concave rear end profile. Hyundai used a lot of high-strength steel in the construction of the GT’s body, which has made the vehicle 61 pounds lighter, yet also 22% stiffer. 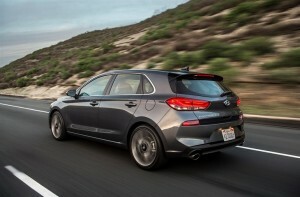 The shape of the Hyundai Elantra GT body allows for some serious cargo space, with 24.9 cubic feet now available, which expands to 55.1 cubic feet with the back seats down. 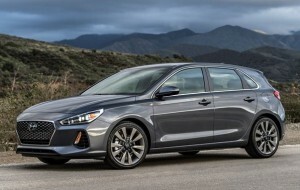 That’s a big jump on the 14.4 cubic feet of space in the Elantra sedan, and it also eclipses much of the car’s competition. The seats up capacity tops the Mazda3, VW Golf, and Chevy Cruze hatchback, and it also bests the Honda Civic Hatchback with the seats down. The base Hyundai Elantra GT – 2018 model – comes equipped with a 2.0-liter 4cylinder engine that delivers 162-hp and 150-lb.-ft. of torque, with your choice of a 6-speed automatic or manual transmission. The 2018 Hyundai Elantra GT Sport goes with a 1.6L turbo engine that generates 201 horsepower and 195 lb.-ft. of torque. It comes with the 6-speed manual or the option of a 7-speed DCT. This model also adds 18-inch alloy wheels, independent suspension, and larger brake discs than those found on the sedan. Hyundai has gone all out to make the Elantra GT as sporty as possible, going as far as putting it through its paces at the famed Nurgurgring test track. The interior of the 2018 Elantra GT 5-door hatchback is similar to that of the sedan, with one major difference, which is the 8-inch touchscreen infotainment system, which comes as standard on this model. You will find the uniquely shaped system sitting on the dashboard on a neat little stand. Use it to gain access to Android Auto, Apple CarPlay, and more. Other Elantra GT features include, optional LED headlight, the Blue Link telematics system, dual-zone climate control, and wireless phone charging. Active safety features include blind spot warning, pre-collision braking, lane keep assist, and wireless phone charging. Closer to the release date is when pricing and fuel economy numbers will be released, but even with the details that we have here, the Hyundai Elantra GT 2018 looks like it’s set to be a major player in the compact hatchback segment.